Fred. Olsen Cruise Lines’ 804-guest Black Watch will enter dry dock at the Blohm + Voss shipyard in Hamburg, Germany in November 2016, in preparation for the forthcoming 2017/18 cruise season. The ship will undergo various engineering works, general maintenance and refurbishment during the dry dock, as well as the creation of several new public areas and guest facilities, as part of a multi-million Pound investment. Black Watch will depart from Tilbury, UK for Hamburg on November 18th, with work on the dry dock expected two days later. Mike Rodwell, managing director of Fred. 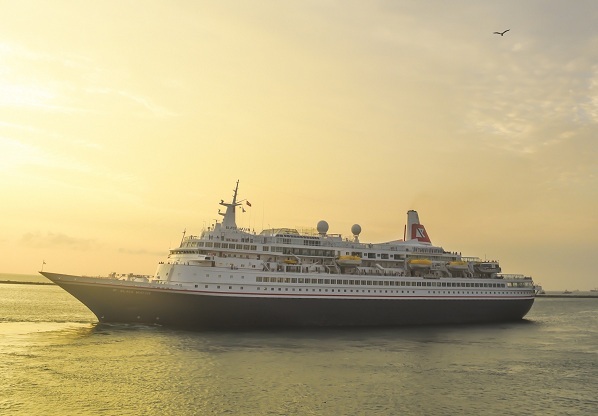 Olsen Cruise Lines, said: “Black Watch is one of Fred. Olsen’s most popular cruise ships, and it is important that she always looks her best. “During her 26-day dry dock in Hamburg, as well as the usual maritime inspections and maintenance work, we will also be undertaking major upgrades to the cabins and public areas throughout the ship, to ensure that we continue to provide the best facilities possible to meet our guests’ expectations. A key focus of Black Watch’s refurbishment will be the 423 cabins across the ship, on Marquee Deck 9, Bridge Deck 8, Lido Deck 7, Main Deck 5, Atlantic Deck 4, and Marina Deck 3. A new interactive in-cabin TV system will be installed across the ship, equipped with all the latest features and connectivity. Bathrooms will be refurbished, and all cabins will feature safes and mini-bars, as standard. To enhance the on-board experience for guests, the Marina Cinema on Marina Deck 3 will be upgraded with the latest ‘3D’ technology, enabling the Black Watch team to show 3D films and other programmes. Following Black Watch’s dry dock, the ship will recommence her cruise season from Tilbury, UK, with a seven-night ‘German & Danish Christmas Markets’ cruise in early December.